Mad Monkey Phnom Penh was the original Mad Monkey Hostel. Our sprawling property in the heart of the popular BKK1 district is the perfect place to meet people and explore this city of culture and nightlife. Enjoy our Rooftop Bar, Swimming Pool, Restaurant, and massive spread of tours and events. Press Play to see what’s waiting for you in Phnom Penh! Why Visit Phnom Penh with Mad Monkey Hostel? Mad Monkey Hostel Phnom Penh was our first hostel and the original Mad Monkey. Stay with us for an exceptional social experience. At Mad Monkey you’ll meet other traveling backpackers in Phnom Penh and enjoy all the perks of our clean, modern, 220-bed hostel accommodation. 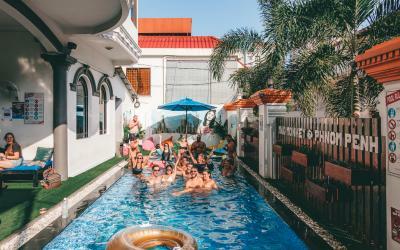 We are one of the few hostels in Phnom Penh with a swimming pool – don’t underestimate how key a pool is until you’ve spent an afternoon in the Penh! 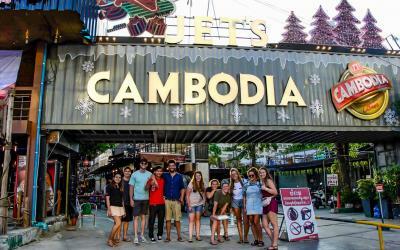 Our hostel in Phnom Penh also offers all of the the amazing social facilities, bar scene, communal lounge space, and international restaurant that have become synonymous with the Mad Monkey name on the Southeast Asia backpacker trail. Phnom Penh is, among other things, the place that people come to to learn about the dark history of The Khmer Rouge. Our Phnom Penh hostel is well situated for visiting the Killing Fields and S21 Prison, and low cost tours of these sites leave every day from Mad Monkey. Beyond these important historical sites, there is so much more to discover in the city. 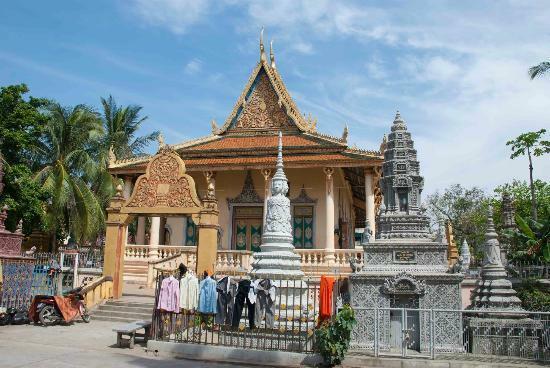 You can’t leave Phnom Penh without visiting the Royal Palace, a silk farm, some museums, cultural shows, or any of the other awesome things to do in Phnom Penh. And then there’s the famous Phnom Penh Nightlife…! This city is so much more than just its recent troubled history. If you are wondering how long to stay in Phnom Penh, we would recommend staying 3 or 4 days to really get the most out of the Capital. Anything less means you won’t get the opportunity to fully experience this charming city. 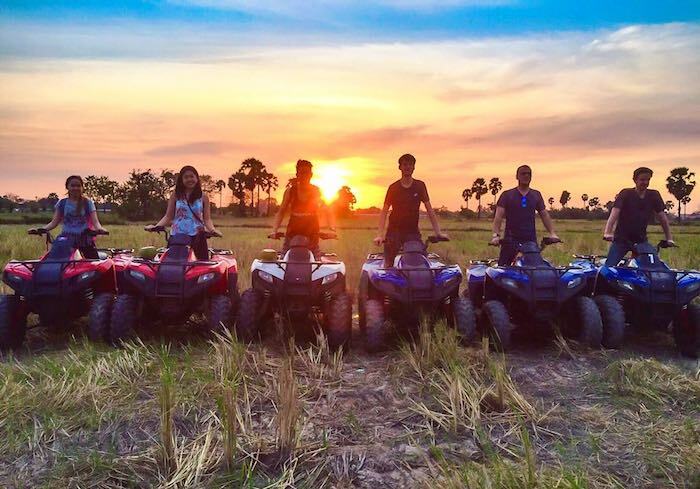 Our knowledgeable and friendly local team can help you plan your trip to Phnom Penh, and arrange low cost tours, activities and excursions that will keep you busy for days. 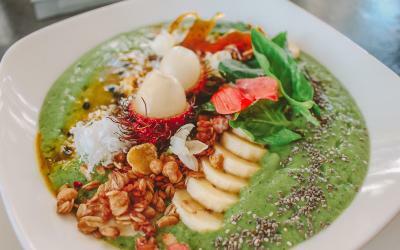 When considering where to stay in Phnom Penh, Mad Monkey is one of your best options. For one thing, it’s a great place to party with low cost rooms and dorms and an active bar scene where you can meet lots of new people. We are not, however, only a party hostel! We also offer cheap accommodation designed for a good night’s sleep in the Villa side of the hostel, allowing you to choose to join the party or leave it if you just need to relax (see Accommodation box below). 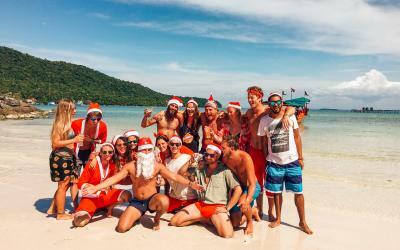 Mad Monkey is right for you if you are searching for a sociable hostel where you can meet people and have fun. Every stay is backed by our customer promise “No Stress, No Worries: a worry and stress free stay for every customer.” If anything is wrong during your stay, we will make it right. In fact our customers have so much fun with us, our hostel chain has been awarded two coveted Hoscar awards from Hostelworld. 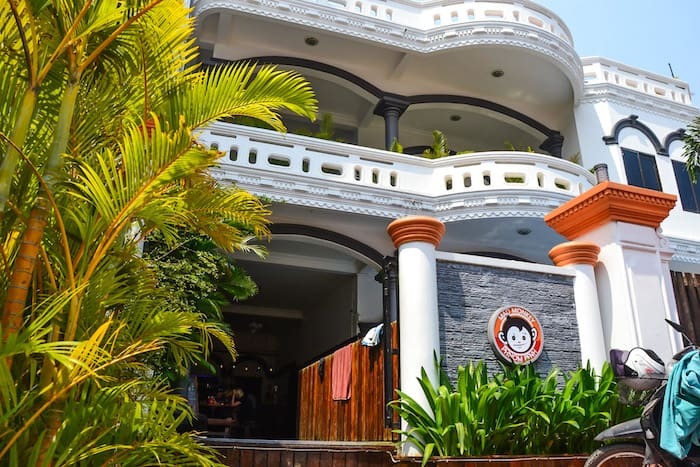 Mad Monkey Phnom Penh is a six-time award winner of TripAdvisor Certificates of Excellence, and has been chosen as the recommended hostel in Phnom Penh by independent travel blogs, including Backpacker Banter. All of this has resulted in an average occupancy of over 97% at our hostel – so it is important that you make your Phnom Penh Hostel Booking with Mad Monkey online today in order to avoid disappointment! 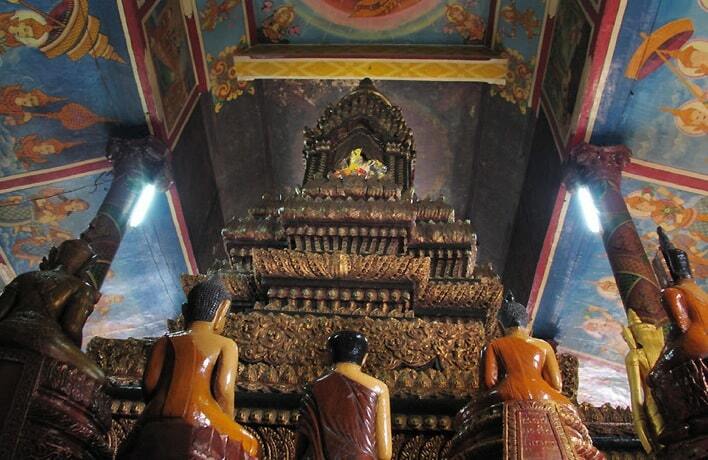 There is so much more to see in Phnom Penh than just The Killing Fields and S21 Prison. 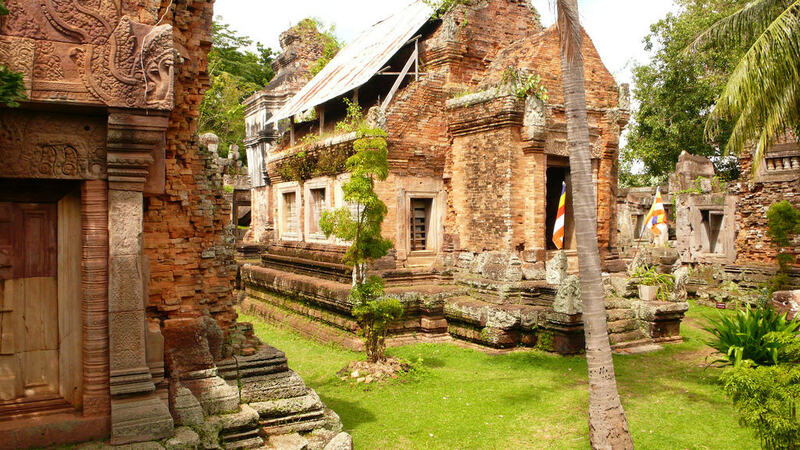 These sites are important, but to only see them and then move on from Phnom Penh would be a mistake. 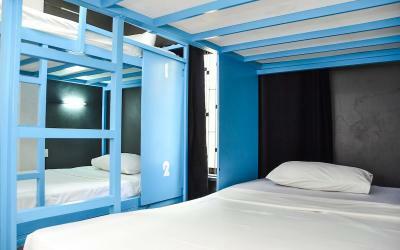 Our hostel is located in the backpacker area of Phnom Penh in the BKK1 district. 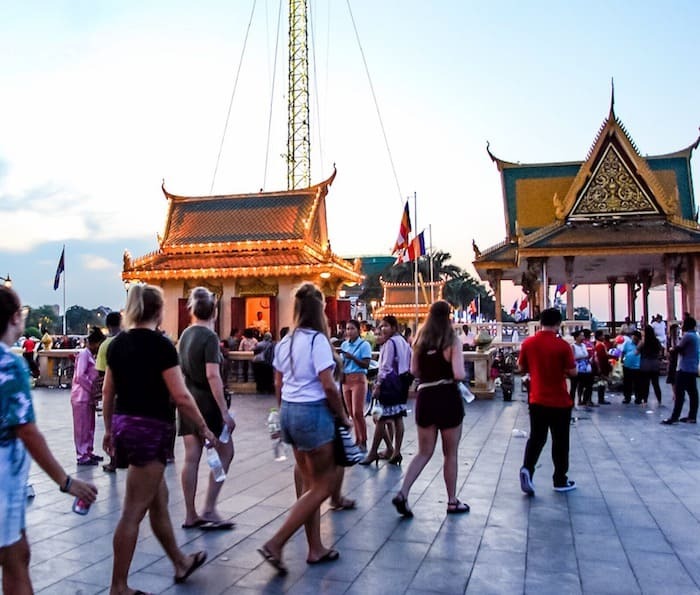 We are ideally located for visits to the Royal Palace, The Silver Pagoda, and Wat Phnom and we’re close to the city’s best museums and art galleries. 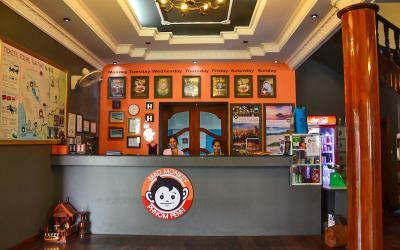 Activities in Phnom Penh can be booked at the Mad Monkey tour desk. 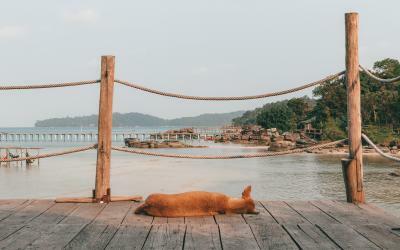 We’ve got a wide range of options, including kick boxing, the Silk Island silk farms, the water park, the shooting range, and regular boat parties on the Phnom Penh river. Phnom Penh’s shopping is both varied and abundant. The most popular markets, including Central Market and Russian Market, are just a few minutes away by tuk-tuk from Mad Monkey. There are also modern shopping centres offering boutique shopping experiences for every budget. 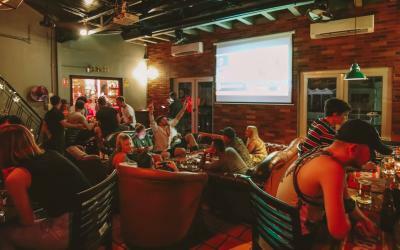 Phnom Penh Nightlife is centred around the backpacker area of Phnom Penh, Golden Street is just two blocks away and offers lots of bars and one awesome nightclub. The bars and pubs of Riverside are just a few minutes away in a tuk-tuk. 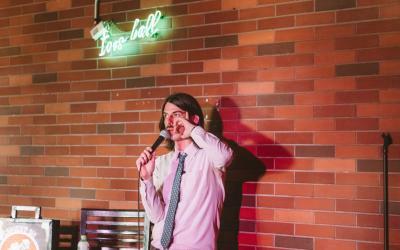 Phnom Penh’s most popular backpackers club, “Club Love,” is a 3-minute walk away from Mad Monkey. Other nightclubs including Heart of Darkness and Pontoon are located close by to the hostel as well – just a short tuk-tuk ride away. 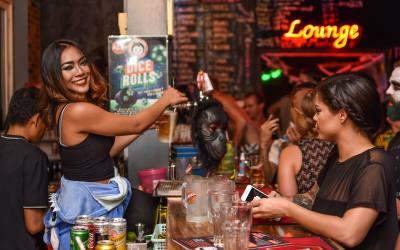 Mad Monkey also offers a weekly pub / bar crawl tour of Phnom Penh every Thursday evening. You can buy a wristband from the hostel for just $5 to join in the fun. You’ll enjoy half-priced drinks during the pub crawl. Even better, 100% of the money generated by the pub crawl is donated to education programs for the poor meaning that you can have a good time and ensure that you are having a positive impact as you travel. We offer a varied number of choices for accommodation in our hostel. 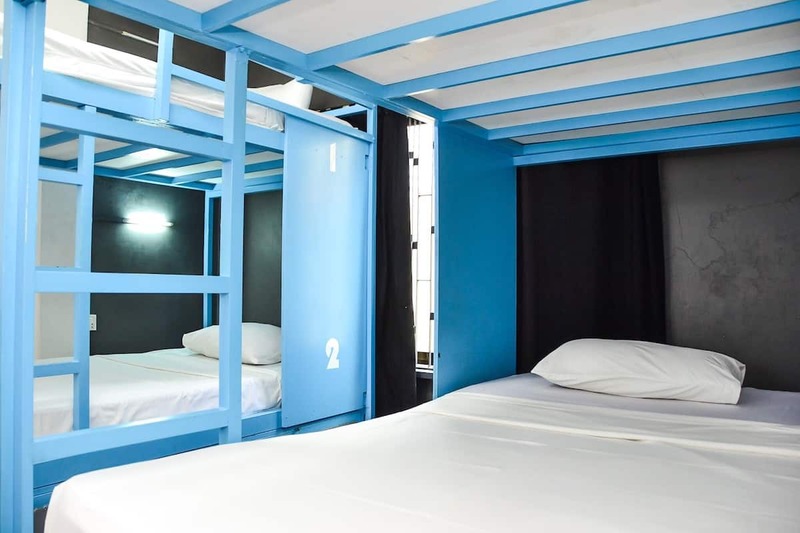 There are Mixed Dorms of various sizes, Female-Only Dorms, Private Rooms that sleep 4, Double Rooms, Triple Rooms, and Budget Single Rooms.Our room prices are low cost. We have cheap rooms in Phnom Penh available for backpackers on the lively Bar side of the hostel, and quieter mid-priced rooms and dorms available on the Villa side of the hostel. All of our accommodation is clean and regularly checked. We have communal facilities including a TV area for films and watching football, a rooftop bar, a swimming pool with a poolside bar, and a large restaurant serving international food with low prices and a varied menu. We even offer regular yoga classes in the hostel. We have a large pool on the Villa side of the hostel. All Mad Monkey guests can access the pool free of charge. Towels are available with a refundable deposit. We also have a small shop where you can pick up essential toiletries, locks for lockers, and souvenirs. 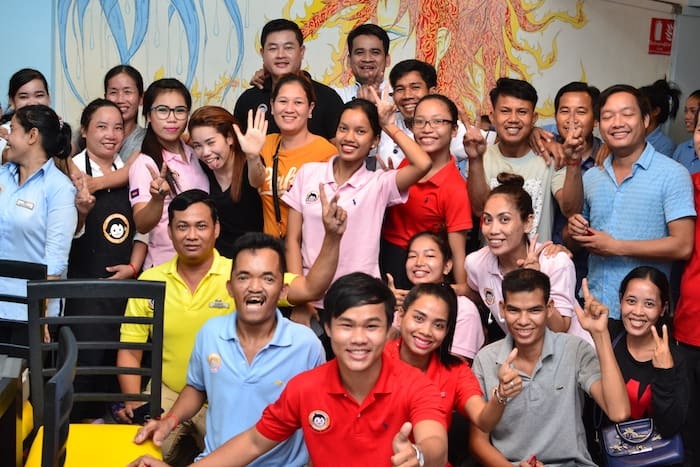 Our rooms have been awarded a cleanest rooms in Phnom Penh award from Hostelworld. We provide air-conditioning in each room for our guests’ comfort. The hostel is staffed by a security team 24/7 for your safety. We also have fire-alarms and fire escapes and regularly conduct fire drills to ensure that our hostel in Phnom Penh not only offers the best standards in comfort and a fun environment, but also is as safe and secure as possible for our guests and staff. This attitude is carried out through every aspect of our operations, from constructing our hostel with the highest quality materials through to insisting on meeting international hygiene standards in our restaurant. 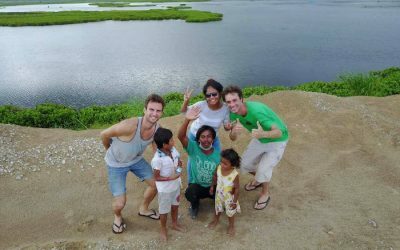 The reason we started our hostel was to have an impact on our local community. In fact it defines our core purpose as a company: providing the best customer experience, in the most sustainable way, for the benefit of our guests and our local communities. All of our team members are provided with excellent working conditions. This includes paid vacation time, bonus pay on national holidays, a working wage (well in excess, unfortunately, of the average salary at hotels in Phnom Penh), overtime pay, a weekly day off, opportunities to travel to our other hostels, free health and dental care, financial support for education, and an annual staff trip and party. These factors combined allow each employee to better their own situation and that of their families, which has a ripple effect throughout the community. Many of our staff come to us from poor backgrounds and may have limited access to education growing up. Each member of our team is provided with regular training to help them develop their careers. Mad Monkey also provides free English lessons for any staff member that wants to study. We also provide support to our team with education grants and interest-free loans for further education. As well as supporting the team within our hostel, Mad Monkey is also incredibly active in our local community. By staying at our awesome socially responsible hostel your stay will be supporting education, clean water access, and arts projects in Cambodia. Learn more about our work in the community here. 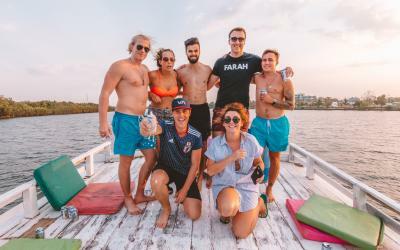 So if you are truly passionate about traveling responsibly in Cambodia then a stay at Mad Monkey is one way that you can really deliver meaningful and sustainable positive change where it counts. Whilst also having a great time and meeting great people. Win-Win-Win! Our Phnom Penh hostel has a full visa processing service. We are able to turn visa applications around within 24 to 48 hours, depending on the country of application. 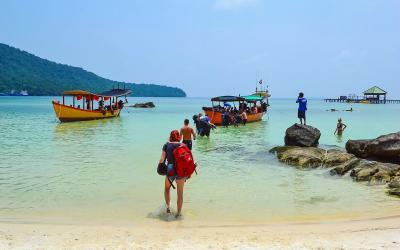 Our travel desk is also able to assist you with booking bus tickets in Cambodia, boat transfer and tickets to Siem Reap, and bookings for our Mad Monkey hostels in Siem Reap, Kampot, & Koh Rong Samloem. 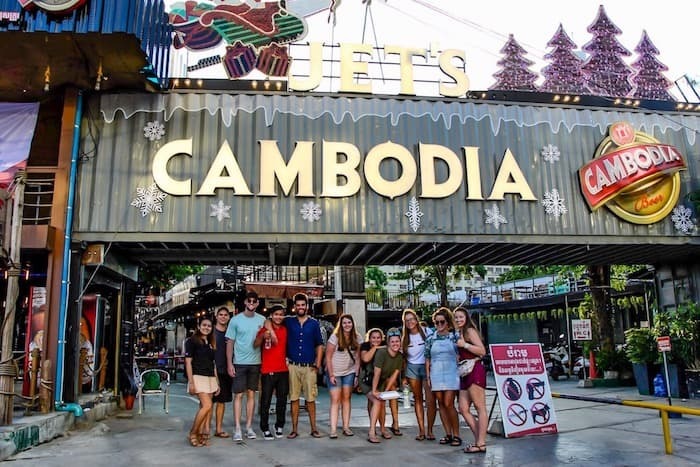 A full schedule of Phnom Penh tours and activities are available to be booked from the hostel, including split-cost group tuk-tuk tours of the city. All of our Mad Monkey tuk-tuk drivers are provided with fair pay and we enforce a recommended price list to ensure that our guests get the best service possible whilst our drivers also earn a fair working wage. See all of our tour offerings here. 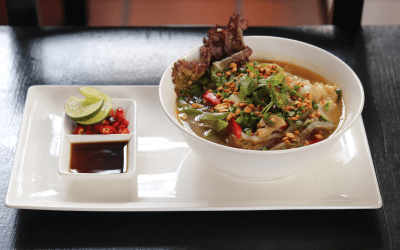 Mad Monkey is centrally located in Phnom Penh’s popular BKK1 neighbourhood, an up-and-coming area full of cafés, restaurants, and bars. Our hostel is spread over 2 buildings that are across from each other on Street 302. You’ll see our restaurant at ground level on one side, with some picnic tables out front, and our Villa building on the other side, with motorbike parking out front and the swimming pool inside behind the fence. Reception is located inside the Villa. We’re easy to find, no matter how you’re arriving in Phnom Penh. The prices for rides from the airport are set: $9 for a tuk-tuk and $12 for a taxi. This only includes one stop, so drivers may ask you for more if you’re splitting with others and want to make multiple stops. You can negotiate with them, but it is fair of them to ask.